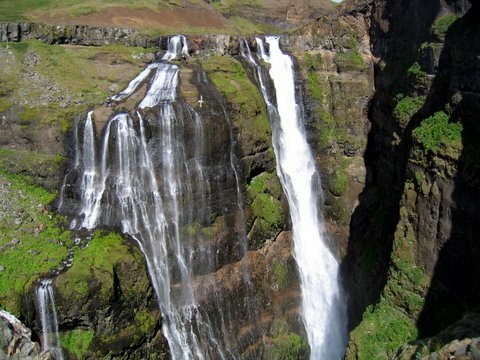 At 196 meters, the Glymur Waterfall is the tallest in Iceland. The waterfall can be accessed from the small village Botsna, by hiking. The best wiev of the waterfall is from the south side. The south trail can be hazardous, though. One has to cross the river and it passes steep edges and dropoffs. The trail is marked, and there are set up ropes one can use in the steepest climbs.